An abstract sculpture of a hanging tree will be a key interior design feature in the main lobby of the new building. Colorful, engaging spaces and child-friendly art installations are woven throughout the fabric of Akron Children’s Hospital’s facilities. It’s an important part of the care we provide. Spaces that make kids feel relaxed and happy, even though they’re in the hospital, can actually help with recovery and ease pain. It was with this in mind that hospital leadership asked the design team for our 7-story medical tower to look “through the eyes of a child” during the planning process. The result is The Backyard, the new building’s design theme. The new ER space will represent the puddle in The Big Backyard Theme, using aqua as the primary color. When visitors walk off the elevators, they’ll also see large-scale murals representing the appropriate theme for each floor. Beyond the art and colors of the theme, the design team had other important considerations. To achieve LEED Silver certification, the interior design team is avoiding paints with volatile organic compounds (VOC) and ensuring that carpet and flooring adhesives have low VOC levels. They’re also considering ease of maintenance. The needs of patients and their families have also been top of mind. 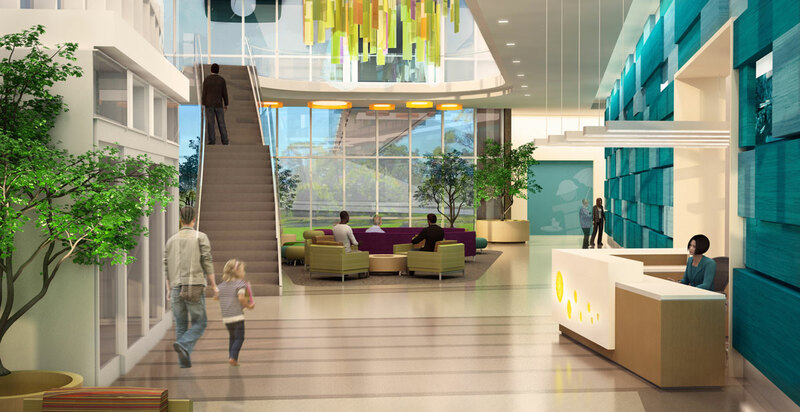 Both the main lobby and outpatient surgery center waiting area will have play areas, featuring a backyard fence with peek-a-boo holes. Orange will be the primary paint color of the outpatient surgery center. The holes will be placed at eye levels appropriate to different ages. When you peer through the holes lower to the ground, for instance, you’ll see graphic and interactive elements aimed at toddlers and preschoolers. The middle will be geared toward the child and young adolescent age groups, and the top will contain teen and adult content.